March 3, 2015 – Developers and waterpark-loving families alike are watching for the excitement to unfold this year — as brand names, like Lego, Nashville, Dollywood, Kalahari, Norwegian Cruise Lines and Genting open new properties and add to existing ones. In January 2015, Blue Harbor Resort in Sheboygan WI added The Riptide, a double-wide indoor surfing ride called the Flowrider. About 70,000 gallons of water is pushed 30 mph up a 25-degree ramp by two pumps to create the wave. Installation was provided by Neuman Pools Inc of Beaver Dam WI. The new ride not only extends the surfing season amid 84-degrees year round, it allows the indoor waterpark resort to attract teens in addition to the younger middle-school generation, according to David Sanderson, general manager. For more, call 866-701-2583. Camelback Mountain Resort in Tannersville PA, a ski resort in the Pocono Mountains, is rapidly adopting the four-season strategy. It is already a successful ski and snowboard resort in the winter that transforms itself into Camelbeach Outdoor Waterpark and CBK Adventure Park in the summer. It attracts over 900,000 visitors annually. In 2013, Camelback owner Spirit Realty, a Scottsdale real estate investment trust, sold the resort for $69.2 million to EPR Properties, also a REIT headed by David Brain. EPR’s ownership strategy is to purchase resorts and lease them back to their operators. Camelback is leased to CBH2O headed by Art Berry and Ken Ellis, who have operated the resort since 2005 and have extended their lease for another 20 years. Camelback Mountain already offers 160 acres of snow skiing with 37 trails, 15 lifts, 100% snowmaking coverage, 100% lighting for night skiing, a base lodge and a 40-lane snow tubing facility, the biggest winter Snowtubing Park in the USA. In spring, crews convert the ski resort into Camelbeach Outdoor Waterpark ready to open by Memorial Day. Camelbeach provides 37 waterslides, rides and attractions including 12 thrill rides, 4 family rides, 4 kiddie rides, a lazy river, several pools and a sandy beach. In summer there is also CBK Adventure Park which offers a tree-top course, a 1000-foot zipline, a climbing wall, free-fall, bungee jump and a mountain coaster. But that’s not all! Plans call for a $163 million, 25-acre project at the base of Camelback Mountain that includes a 9-story, 453-room hotel and 134,000 sf indoor waterpark. Art Berry and Ken Ellis in late 2013 finalized their TIF Agreement with local officials to upgrade water, sewer, electrical lines, roads and two exits off I-80. Crews laid utility lines and water mains for a water tower built in early 2014. Excavators moved rocks and dirt, built retaining walls and prepared the hotel building pad by year end. Horizon Construction from Wisconsin is general contractor on the job and is doing the construction of the hotel and indoor waterpark. The hotel opens mid-April 2015. For more, call 570-629-1661 or go towww.skicamelback.com. Legoland Florida Adds Hotel to Its Water Ski Theme Park in Winter Haven FL. The theme park announced that a new 152-room hotel located on its property would open its doors May 15, 2015. The hotel makes the Lego theme park more of a destination and increases the appeal for families that wish to stay multiple days in Winter Haven — making Disney World the quick day trip. All guest rooms are themed, so your family can choose from one of three popular Lego themes — pirates, kingdom or adventure. Rooms include two separate sleeping areas, with a king-sized bed for grown-ups and a separate area for up to three little ones, complete with a bunk bed, pull-out trundle bed and their own TV. You’ll ride in disco elevators that play dance music every time the doors close. The hotel will feature a Master Model Builder Workshop inside for the guests to see. The expanded waterpark features a new 5-foot deep wave pool, 2 enclosed slides, 3 speed slides, playground, tipping bucket, lazy river, toddler pool, grille and surf shop. Legoland hotel guests have early access to theme park rides and attractions before the park officially opens. For more, go to www.legolandhotel.com. Nashville Shores Adds a $2 million Raft Ride, Treetop Tours, Cabins & RV Park which will be ready for opening to the public May 9, 2015. The Big Kahuna is a 57-foot-tall, 530-foot-long 4-passenger family raft waterslide from manufacturer ProSlide Technology. Other additions include a new retail concession and upgrades to the front gate. 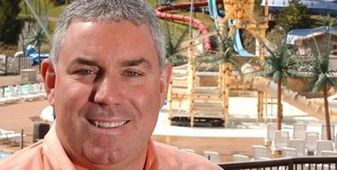 Since purchasing the park in 2009, former Six Flags ceo Kieran Burke has doubled the size of the park with a treetop adventure area, 20 lakeside cabins, an 84-unit RV park, wave pool, lazy river, giant water treehouse and a spray ground. Nashville Shores has 104 lodging units. For more, contact general manager Larry Edgmon at 615-889-7050 or go to www.nashvilleshores.com. Splashway Waterpark Adds a 6-foot-deep, 30,000 sf Wave Pool to its outdoor waterpark in Sheridan TX — scheduled to open in May 2015. The waterpark covers about 10 acres of the 80 acre resort. Splashway is also an RV Park & Campground with tent sites, cabins and cottages. For fun, there’s 8 ziplines that run 70-feet high over 4,000 feet of cable. For more, talk to Matt Tice at 979-234-7718. Or visit www.splashwaywaterpark.com. Rippin Rapids Resort in Rapid City SD is scheduled to open in June 2015. The resort features a Waterpark & Adventure Sports Center built by Robert Akers Sr and partner Monte Hartl of Capitol Management. Of 93,000 sf total space, more than 77,000 sf is indoors — providing year-round surfing on a SurfStream standing wave and a PerfectSwell moving wave created by American Wave Machine. The indoor waterpark and adventure center also include 3 waterslides, a lazy river, a ropes course, rock climbing wall, ziplines racquet ball courts, massage salon and 7 retail spaces. Rippin Rapids will open at East Mall Drive next to the 100-room Hilton Garden Inn, also owned by Akers, with everything under one roof. For more, contact Monte Hartl at 605-791-9004 or visit www.rippinrapids.com. The Dollywood Company of Pigeon Forge TN consists of the 150-acre Dollywood theme park, the 35-acre Dollywood Splash Country outdoor waterpark, Dollywood Cabins and the new Dollywood DreamMore Resort, which is expected to open its 307 rooms in June 2015. DreamMore Resort is inspired by Dolly Parton’s warm childhood memories of growing up in the Great Smokey Mountains. Families can sit on the big front porch and share stories, celebrate memories and create new ones. There are family reunion suites “where all the doors are opened in between so you can bring your whole family and everybody can just run back and forth,” according to Dolly herself. The nearly 4,000 sf resort pool meanders through a lush pool deck. At one end is a gentle waterfall just outside the lobby’s 3-story windows. On the other end is a zero-entry swimming pool that slopes just like a natural pond or lake. Guests can paddle, float or play in depths up to five feet. Best of all, the resort is next door to the theme park and the waterpark. For more, go towww.dreammoreresort.com, visit www.dollywood.com or call 1-800-DOLLYWOOD. Kalahari Waterpark Resort in Pocono Manor PA is scheduled to open in July 2015 with 457 rooms, 3 restaurants, an 87,000 sf outdoor waterpark, a 100,000 sf indoor waterpark, a 65,000 sf convention center, a 10,000 sf spa and a 30,000 sf family entertainment center that includes 6 lanes of bowling and miniature golf. The $350 million 150-acre project is nearing completion of the first of two construction phases. The second phase, scheduled for completion in 2016, will add another 500 hotel rooms, expand the resort and add 100,000 sf to the indoor waterpark. Ninety percent of the contractors for the project are from Pennsylvania. 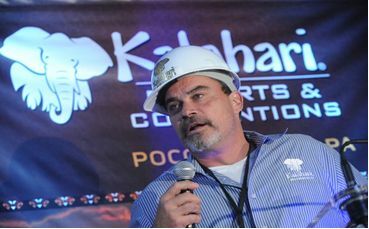 The resort will be African-themed just like the first two Kalahari Resorts in Wisconsin Dells WI and Sandusky OH, according to CEO Todd Nelson. He recently traveled with his family, and a small film crew, to Africa to explore the area and purchase furniture to give the resort an authentic look and feel. Package room rates start at $200 to $300 with admission to the waterpark included in the price. While the Poconos supply of hotel waterpark resorts is expanding, the destination is still under-served due to the heavy population in the New York City, New Jersey and Philadelphia markets. The new lure of the Poconos is undeniable according to Nelson. The region attracts 25 million visitors each year, with over 90% coming for leisure, generating 33,700 jobs, $1.2 billion in labor income and about $300 million in state and local taxes. For more, call 877-525-2427 or go towww.kalahariresorts.com/pennsylvania. 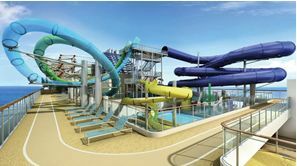 Norwegian Cruise Line’s Escape Aqua Park will launch November 2015 from Miami FL with 4 waterslides, a kids aqua park, 2 pools and 4 hot tubs plus several adventure sport facilities. The four waterslides include a dual racer, a free fall slide where side by side racers fall into a loop when the floor drops from underneath them, and more relaxing family open body slides. The kids aqua park features an enclosed tube slide and a 2-story climbing structure. The adventure sport facilities include a 3-story, 99-element ropes course, 2 walk-the-planks that extend over the edge of the ship and ziplines that allow guests to soar through the air. The Norwegian Escape will be the line’s largest ship to date — carrying 4,200 passengers. It will sail to the Caribbean from Miami year round with stops in Tortola, St Thomas and Nassau, starting November 2015. For more, dial 888-444-5986 or go to www.ncl.com/escape. Doug Pope’s Floating Oceana Water Resort about 16 miles northwest of Key West FL has stalled due to lack of financing. The first of its kind concept calls for 50 rooms to be built 6-stories high on a floating platform in the Gulf of Mexico. The resort would be built on a 230-foot by 128-foot platform atop four semi-permanent pilings on pads resting on the sea floor, 55 to 60 feet down. The resort is planned as a partially moveable structure. Estimated cost of construction is $20 million. Construction may start in late 2015 or 2016. Target: avid fishermen. For more, investors may contact Doug at 904-838-6619. Malaysian-based Genting bought the 87-acre Las Vegas site for its Resorts World from Boyd Gaming Corp in March 2013 for $350 million. Boyd halted construction on the unfinished Echelon Place in 2008 when the recession hit the US. Genting announced construction plans that would take place over multiple years and consist of two or three phases. Resorts World Las Vegas’ first phase, which will take $4 billion and two to three years to complete, includes 3000 hotel rooms, 3,500-game casino, 30 restaurants/bars, a 4,000-seat theater for live entertainment, aquarium, observation deck and an elaborate garden front entrance along the Strip. In phase 2 and subsequent phases, Resorts World Las Vegas will add 3 new hotel towers, a 1-million sf convention center, a still-to-be determined large-scale attraction and a waterpark. Obviously, the hotel waterpark is at least three years away, at the earliest, and is one of many attractions that Genting wants to bring to the table. Genting says it wants to go back to what were once Las Vegas standards: (1) themed resorts where vacationers could escape to another culture or time period; (2) family attractions, such as bowling alleys, movie theaters, aquariums and waterparks; and (3) live entertainment in both large showrooms and small intimate theaters. Las Vegas has turned the corner since the global economic collapse. In 2012 and 2013, the city set records for annual visitors at nearly 40 million. In March 2014, it set an all-time record for a monthly visitor count of 3.7 million, according to Howard Stutz, reporter for the Las Vegas Review-Journal. For developers and lovers of waterparks, keep Genting on your watch list as they are a major worldwide player. The company generated $5.2 billion in revenues in 2013, has more than $5 billion in cash on hand and owes only $3 billion in long term debt. For more, go to www.genting.com or stayed tuned towww.vegaschatter.com. Closed: The Depot Renaissance Hotel Plans to Remove Its Indoor Waterpark. CSM Corp is planning to demolish the 10,000 sf waterpark inside its Renaissance Hotel in downtown Minneapolis MN to make way for 110 additional guest rooms, fitness center, lounge and pool. The hotel indoor waterpark was originally created in 2001. For more, call 612-340-1000. The Town of Blaineville, part of Greater Montreal, Quebec, Canada, has acquired the 900,000 sf of land it needed to construct its $40 million Aquapolis Indoor Waterpark. About 100,000 sf is being used for the indoor section of the waterpark and another 30,000 sf is being used for the outdoor waterpark. The building will cost $11 million and the equipment will cost $29 million. The remaining space is designed for green parks, parking and 4 to 5 hotels. The Divco Group, Rosdev and Capital Liason are backing the project as investors. Aquapolis will have a 2,500 person capacity, which translates into about 500,000 visitors annually, with ticket prices for the day costing around $27. Aquapolis is scheduled to open in November 2015. As we see it, there are no hotel waterpark resorts in Mexico or the Caribbean that are under construction and opening in 2015. While some of these properties have broken ground, others are in various stages of development and still others have yet to secure financing. What appears on the horizon may not become reality. However, these developments are worth watching! Embassy Suites & Waterpark at Ford Park, Beaumont TX. Blue Mountain Ski Area Adds Hotel & Waterpark, Danielville PA.
Great Wolf Resort, Garden Grove CA. Holiday Inn Express Hotel & Waterpark, Bullhead City AZ. Lakeland Landing Hotels & Waterpark, Yakima-Ellensburg WA. Bahama Bay Outdoor WP & Hotel Indoor WP, Pasco WA. Hotel Waterpark at Grand Texas Hotels & Theme Park, Houston-New Caney TX. Colorado Grand Resort & Waterpark at Polaris Pointe Mall, Colorado Springs CO.
Schlitterbahn Indoor-Outdoor Waterpark, Austin-Cedar Park TX. Sunset Bay Beach Hotel & Waterpark, Irving NY. Spa Castle with Indoor-Outdoor Waterparks, Tannersville PA.
Four Points by Sheraton & Reopening Coco Key, Arlington Heights IL. Kalahari Waterpark Resort Phase 2, Pocono Manor PA.
Uphoff Hotel Indoor Waterpark Resort & CC, Phoenix AZ and Midlothian PA.
American Dream Hotel & Waterpark Phase 1 & 2, Meadowland NJ. Glenn Straub’s Transformed Revel Waterpark Casino, Atlantic City NJ. Port Royal Resort & Waterpark, Jasper GA.
A New Four Points by Sheraton is expected to break ground in May 2015 and open with 161 rooms in July 2016 for business travelers at Arlington Downs, a residential-retail project in Arlington Heights IL. The original hotel and connected (former Coco Key) indoor waterpark closed in 2009. The original hotel has since converted to 214 luxury apartments with no indoor access to the 55,000 sf waterpark, which remains closed. Plans call for an expansion of the indoor waterpark in May with reopening in December as a standalone facility. Apparently, apartment dwellers and hotel guests, along with locals, will have to brave the cold weather to reach the indoor waterpark. Hotel climate-controlled connections are vital to the success of any indoor waterpark. Developers have an agreement with Wilderness Resorts of Wisconsin Dells to renovate, add 10,000 sf of space and manage the waterpark, as we understand it. For more, call Kevin Boyd of SRS at 312-279-5331 or David Trandel of StoneStreetUSA at 312-286-0395 or Chris Matthews of Argent Group at 847-814-9694. Website is www.argentgrp.com. Grand Texas is a 610-acre sports and entertainment district being developed by Monty Galland in New Caney TX northeast of Houston. The development includes a 40-acre waterpark, 5 hotels totaling 860 rooms, 150-acre theme park, 83-acre sports complex, 144-unit RV resort park, 450,000 sf of retail, dining, bowling, movie theater, family entertainment center, miles of horseback riding trails, motorsports park, 30-acre educational ranch and hospitality village. Annual estimated draw is 1.2 million visitors, rising to 4.5 annual visitors by 2020. Components are expected to open progressively throughout 2015 and 2016. Construction was scheduled to start in 2014 on an RV Park, the first of five hotels, a Sports Complex and the Big Rivers Waterpark with a progression of openings by June 2015. None of those facilities have broken ground yet, as of March 1, 2015 — maybe by November. In addition, the Grand Texas theme park is slated to start construction this year on 71 of 150 acres and open in late 2016 or early 2017. As more details unfold, it looks like Texas will have a worthy successor since AstroWorld closed in 2005. To help insure its success, former AstroWorld general manager Chuck Hendrix and Six Flags Magic Mountain director Bob Logan have been brought on board to oversee all design and theme concepts. For more, visit website www.grandtx.com or send a message to Monty Galland at info@grandtx.com. That is what’s expected to open in North America during 2015 and 2016. If we missed something, please let us know.